I have to admit, he is not one of my favorite Christian authors, nor do I think him as brilliant as so many do. I've tried to read the Narnia Chronicles twice. I watched the movie. I appreciate the effort. But. I. just. can't. Of all the books of C.S. 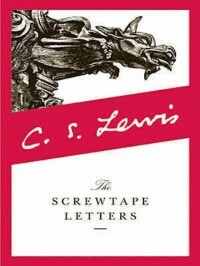 Lewis' that I've read, or tried to read, this is my favorite. It's fantastical and funny and wise at the same time. The devil writes letters advising his nephew on how to deter a man from becoming a Christian and then when he does become one, he works to distract him. While I think real spiritual warfare is much more ugly, I do get a kick out of this book and it offers some deep wisdom in regards to how Christians can get distracted from God.